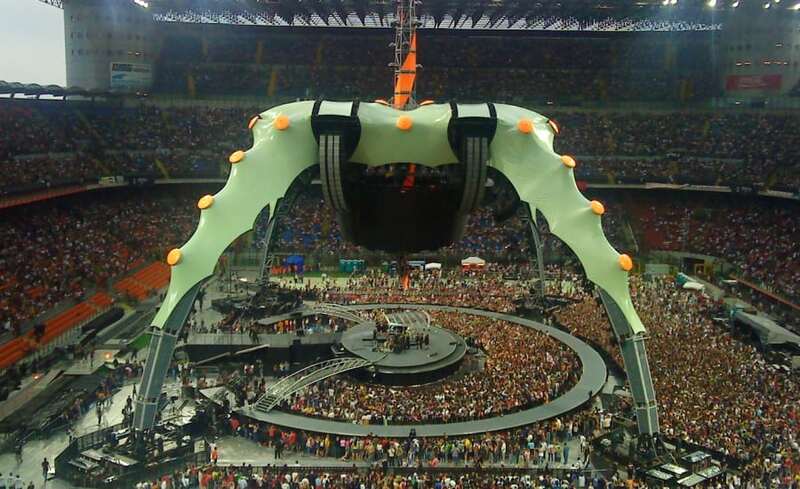 A tensile fabric structure forms the major element of the eye catching stage set for the 2009 U2 360 Degree World Tour. 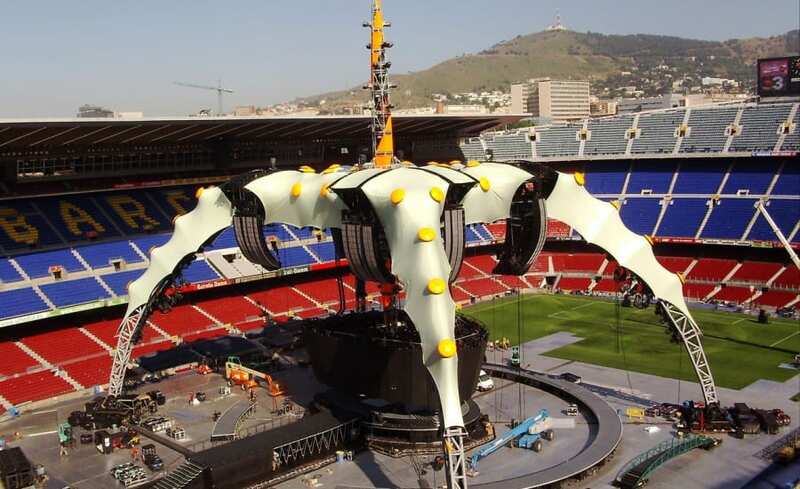 Architen Landrell was asked to provide the tensioned fabric cladding system for the futuristic structure due to their extensive experience in both tensile fabric and fast track staging work. 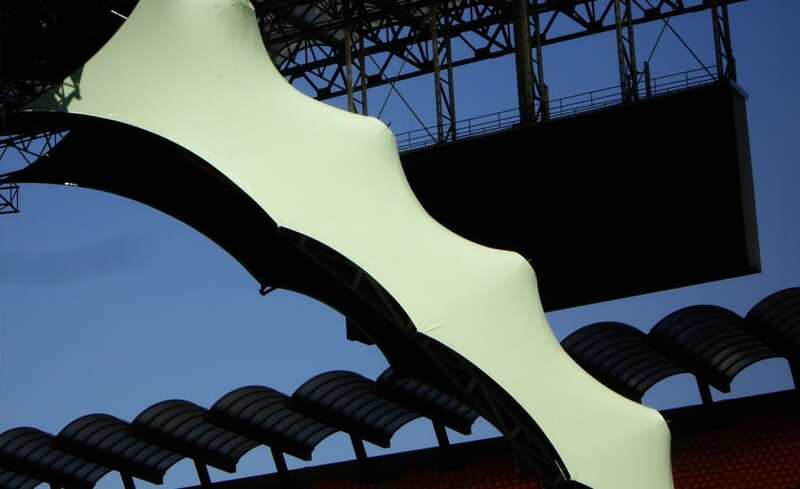 The primary purpose of the fabric membrane is to cover the main steel trussing and to provide shelter from the rain and sun for the band below. The band members, who were very involved in the initial stages of set design, were keen to cover up all steel which may be on show and entirely remove it from sight. Fabric cladding proved an economical and effective solution to achieve this. However, the structure required far more than traditional cladding. 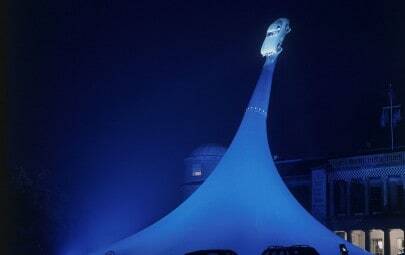 Groups of multi-conic fabric structures cover an octagonal PA truss system supported by four giant arched legs. The design is diagonally symmetrical but incredibly complex so no two areas look the same! 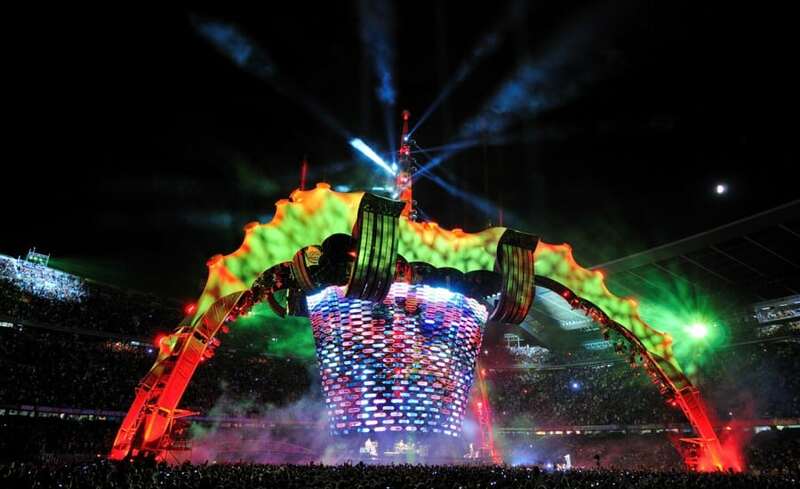 The structure is visually enhanced by the gigantic steel structure supporting it and the dramatic stage lighting. At the top point of every conic is an orange disc lit internally with a cluster of lights giving the impression of a glowing pulse point. 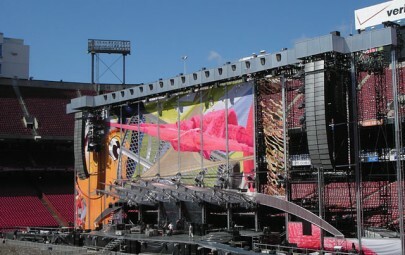 In addition to the dramatic fabric membrane, the centre of the structure also houses a vertical LED pylon and an elliptical, retractable video screen, both designed as interactive staging elements during the live show. Outside the practicalities, the scheme is undoubtedly one of the most dramatic staging structures created; designed for impact and drama and to impress those watching the show below. 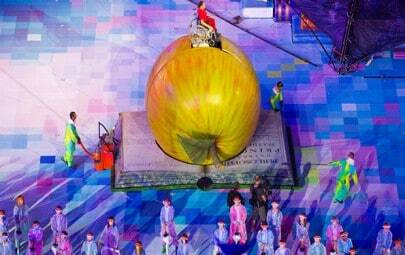 The project incorporated a specific colour run of fabric to meet the design requirements. The PVC coated polyester blackout fabric was manufactured by Serge Ferrari to a specific RAL colour chosen by the band. PVC coated polyester fabrics are an industry standard for this type of use, however, in this instance the flexibility of the fabric also helped to achieve the architects vision and the complex geometry of the forms. The membrane plates were sprayed to be the same colour as the fabric and therefore remain as concealed as possible and not detract from the overall impression. The design of the conics was carefully planned but involved a very straight edge combined with a very deep valley a difficult shape to create! This, along with the diagonal symmetry, meant that the geometry of the structure was extremely complex and required heavy patterning to achieve the correct curvature. The fabric had to be engineered very carefully as there was no adjustment in the steelwork; the fabric had to fix at predetermined points and could only be adjusted minimally on site. As one of the worlds largest touring stage sets there were a lot of people involved in the production and installation and therefore there was a high demand for organisation and project management. Project Manager Kate Cox spent a lot of time flying between Brussels, Barcelona and our UK offices to make sure all went smoothly. As is traditional in the world of rock and pop, we had to work with a very fast turnaround. From placement of order to the consignment of the structure to Barcelona for first fitting only spanned 9 weeks! This meant that there was no time for test run and no time for off site development of the design all aspects had to be spot on from the word go or designed to be adjustable on site.